All Screenflex Room Dividers have the same width of 25″ wide when folded. They will fit through any width doorway. When customers are looking to purchase rolling room dividers they often wonder about the ease of moving it around. Rolling casters support each Screenflex temporary wall making moving each room divider effortless. When using the divider is complete, simply fold up the divider walls, to the standard 25 inches width, they are ready to roll over any surface, over door thresholds, and through standard doorways. 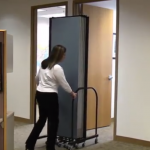 Moving a Screenflex unit through a standard doorway is very simple. A Screenflex unit is 25 inches wide and standard door openings are anywhere from 28 to 36 inches wide. Now you know how rolling a room divider through a doorway is very easy.